On this show, hosts Neil Shuck & Mike Hobbs are joined by rules author Robin Fitton, to talk about his sci-fi wargames rules Gruntz, which are aimed specifically at gaming using 15mm scale miniatures. 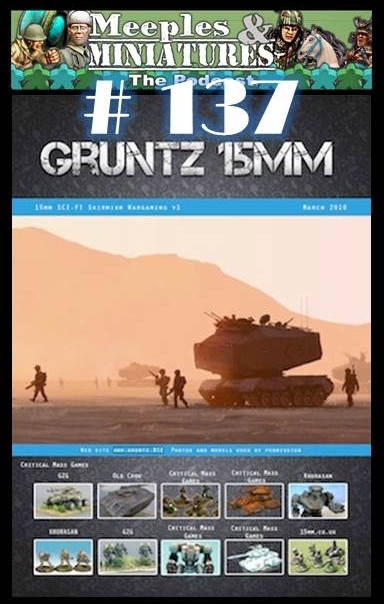 You can find out more information about Gruntz at their website. I’m only part way through the show but I love that you have Robin Fitton on! I play Gruntz (a game from earlier this year: http://imgur.com/a/to1LF#0) so I like the guy for that, but I also learned a lot about painting from his YouTube videos. For example, he’s the one that taught me about wet palettes. Also, you mentioned Dreadball Xtreme in passing. I also backed it, and I’ve played once, and am playing again tomorrow. The minis are another step up for Mantic – these are better than anything they’ve done in restic before. Very clean and detailed. The game is a lot of fun – no major rules differences from Dreadball Original, but the several small differences add up to a completely new game. Looking forward to tomorrow’s commute to listen to some more of the show! I’ve not played Gruntz, but it’s been on my horizon and I’ve watched Robins video’s over the years too. Really enjoyed the episode and looking forward to seeing those covert ops rules come from Clear Horizons (along with my preordered Aurora dropship), which may push me further toward getting Gruntz. Thanks for this episode! Something worth noting is if you get the PDF version, Robin has been updating the changes. On Wargamesvault.com The PDF version I have now is 1.1 edition. I appreciate he made the updates for people who bought Gruntz when it first came out. Listened to it again and it’s just as good the second time. Please invite Robin on again sometime!